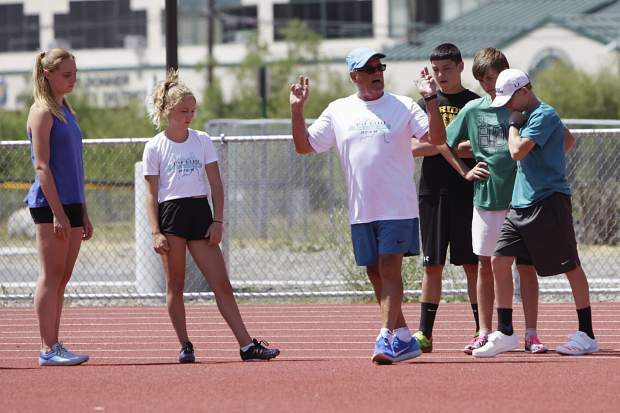 Harry Marra instructs youngsters at the High Sierra Track and Field Camp on Tuesday, July 17. The commands cut through the hot summer air on July 17, as young athletes from middle school up to high school made approach after approach at the high jump crossbar, only to be called back, corrected and told to do it again. However, when those instructions — no matter how seemingly tedious or minute — come from legendary track and field coach Harry Marra, athletes tend to look up and take notice. Little gets by the longtime coach, who enthusiastically worked with the athletes during the three-day camp, methodically correcting each movement and step down to the smallest detail as roughly two dozen youngsters worked through the different disciplines of decathlon. Marra’s experience as a coach spans nearly half a century and has included time coaching athletes such as two-time Olympic decathlon and world-record holder Ashton Eaton, 1996 decathlon gold medalist Dan O’Brien, and Olympic bronze medalist Brianne Theisen-Eaton. While the athletes at the camp worked on their technique, the coaches in attendance benefited from watching one of the world’s best at instructing track and field as part of Marra’s method of teaching coaches. “I do these things called Learn by Watching Clinics,” said Marra. “I was in Austria at the end of May, and I did a clinic and they supplied a long jumper. The other coaches at the camp included Uros Kogal, Rob McClendon, Kevin Wall and Truckee Head Coach Diana Yale. In a time when coaches, parents and recruiters are in dispute over whether young athletes should specialize in a given sport or play several different ones throughout the year, Marra is vehemently against the idea of athletes focusing on only one sport. Throughout the afternoon session on Tuesday, Marra often asked students what other sports they did, making comparisons to things like the eyes of a basketball player as he drives toward the rim and a high jumper’s approach to the crossbar, or how a sprinter improving his running technique will improve his game on the gridiron in the fall. In the case of two-time Olympic champion Eaton, being a multisport athlete was the difference in becoming the world’s best decathlete. “Most of the top athletes I had in decathlon did a variety of other sports,” said Marra. “Ashton (Eaton) is a great example. He was horrible at the javelin when I first got there, and we worked a year and he still didn’t get it. He didn’t get the idea. From there Eaton would go on to become one of the top javelin throwers in the sport. For parents or coaches in disagreement with Marra’s thoughts on athlete specialization, his message was simple.